I was recently thinking back to last year and all the good movies that came out then: 12 Years a Slave, Gravity, Her, Captain Phillips, Prisoners, Mud, Much Ado About Nothing, Pacific Rim, American Hustle, Inside Llewyn Davis, and many others. This year has not been as good, especially as far as Oscar movies are concerned. Boyhood was good, I suppose, but if its main competition this year is Birdman then something went wrong. I’m sorry that most of my reviews this time of year tend to be Oscar-centric. It’s not premeditated; I often just don’t have much else to say about Oscar-bait movies. The Plot: Genius physicist Stephen Hawking (Eddie Redmayne) develops Lou Gehrig’s disease just as he starts working on his PhD and falls in love with his future wife Jane (Felicity Jones). As the disease worsens, Hawking continues his research into the history of time and Jane struggles as both his primary caregiver and as essentially a single parent to three. Their story is sort of inspirational (?). I always find it somewhat off-putting when studios release biopics of still-living people, especially inspirational ones. If your movie depicts someone famous and well-respected, and alive, and possibly in the audience, and more powerful than you’ll ever be, then the temptation is to make them look good. If you can’t do that, then the next best option is to be as inoffensive as humanly possible. Stephen Hawking has had an incredibly difficult life, and his achievements in the face of overwhelming adversity are nothing short of impressive, but somehow he just isn’t a very likable guy. Screenwriter Anthony McCarten and director James Marsh opt to depict an interview-appropriate version of Hawking. His fame has embedded him in the public consciousness; everyone knows what Stephen Hawking looks like and that he’s really smart and has a terrible affliction, so a biopic should aim to show us the man behind icon. There’s a touching moment between him and a doctor when he is first receiving his diagnosis and asks if his brain will still function properly. The doctor responds that he will have his thoughts, but before long, no one will know what they are. Rather than taking their own invitation to show us those thoughts, McCarten and Marsh are content to assume that he is no deeper than his published theories and public appearances. I didn’t learn anything about Hawking that I couldn’t have from reading his Wikipedia page. The other limitation of the living subject is the creative imposition on characterization. When writing any narrative piece, the writer wants to put his own personal stamp on the story, even if it’s been told or lived before. If accuracy poses a major concern, then one’s stamp can’t come in the form of new plot events. Granted, a lot of biopics don’t bother with accuracy at all, but what I’m getting at here is the desire to present an interpretation of the characters involved, to make them deep and relatable humans, even if the emotions and thoughts portrayed don’t bear the greatest exactitude to reality. No one thought to do that for The Theory of Everything. 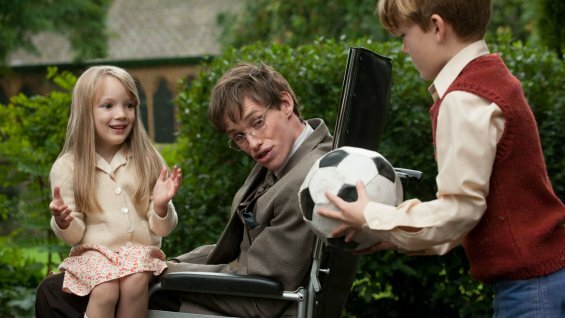 Stephen Hawking ends up a flat character because the filmmakers are uncomfortable with delving into the psyche of someone who’s still alive, and making any of their own inferences or interpretations. Unfortunately, this renders the film a biopic about superficial characters achieving wonders in the face of adversity. That story lacks meaning if there are no people involved. Despite the somewhat bland material, the actors all perform ably. Felicity Jones rather nicely captures the struggle of a woman who is overused, underappreciated, and unflappably devoted. In her singular situation, the right thing to do happens to mirror the most difficult possible thing to do, but she does it anyway because she has a basic moral sensibility. 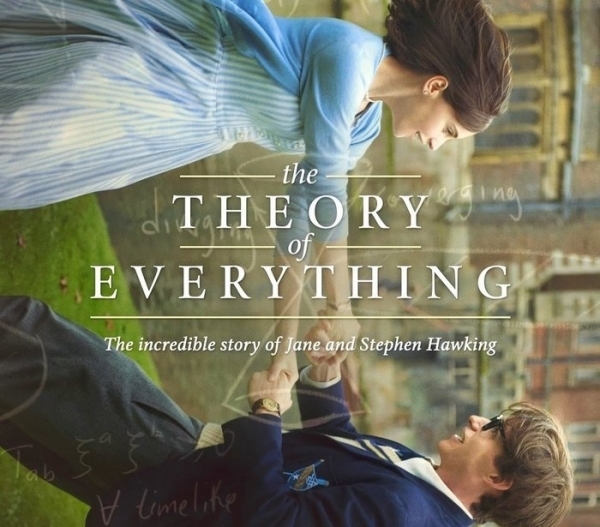 Actually, if The Theory of Everything succeeds in doing anything, it does make Jane Hawking look very good. Granted, she wrote the book that inspired the film, but… I mean, we don’t need to read into that, I think. A more interesting movie would have explored how Jane Hawking doesn’t age a day in thirty years. Eddie Redmayne also delivers a particular impressive performance, and a highly physical one at that. Evidently, he spent several hours a week in training with a dance instructor, to better acquaint himself with his body and master movement in a new, more deliberate manner. It shows. His greatest accomplishment as an actor is in appearing natural in doing something that couldn’t be more unnatural to him. His gradual paralysis feels completely real and utterly convincing onscreen. I got the impression that he (and Felicity Jones) were the only people on the production who considered very deeply the thoughts and emotions of the characters involved. They tried their darnedest, but without a compelling screenplay, an actor’s efforts are severely limited. Ultimately, I think composer Jóhann Jóhannsson did the biggest favors to this movie. His score is at turns nuanced, moving, sad, and uplifting. I guess you could say… wait for it… it hits all the right notes. Eh? Music pun. Seriously, though, I couldn’t be more thrilled about actually liking this score, since it’s probably going to win the Academy Award and they usually pick the most generically Oscar-worthy score of the year. Is this one better than Hans Zimmer’s score to Interstellar? I don’t know, but I don’t care. Music has the power to make or break a movie, to devalue it astronomically, or raise it above its designated station. Jóhannsson’s score definitely did the latter. It brought some emotion to scenes that otherwise lacked, and in turn lent some depth to the film as a whole. A baby shouldn’t need help from the score to get a reaction. In the end, though, The Theory of Everything did lack substance. I want to say that it tried and fell short, but it didn’t. It’s the kind of film that depicts a super-intelligent man with a crippling medical condition and is perfectly happy to let those be his only significant character traits. While not an entirely worthless film (boasting an excellent soundtrack, strong performances, and pleasing visual aesthetics), if you’re interesting in Hawking’s life, I would recommend simply reading a biography. If you’re interested in his science… well, I can recommend a decent science library. Second Breakfast: Selma, Snubs, and Cinematic Standards, Oh My!